The following is a list of codes used in the daily staff journal: VIC = Vicinity, S/A= Small Arms, A/W = Automatic Weapons, AO = Area of Operation, Rds = Rounds (of Artillery, Mortar, Rocket or small arms fire), NVA = North Vietnamese Army, VC = Viet Cong, EM = Enlisted man (G.I. ), CP = Command Post, CO = Commanding Officer, LZ = Landing Zone, CA = Combat Assault (by helicopter), WIA = Wounded in Action, KIA = Killed in Action, MIA = Missing in Action, Fd = Found, Arty = Artillery, Loc = Location, LOH = Light observation Helicopter, 1D, 2D & 3D = 1st, 2nd & 3rd Platoon of Delta Company, Claymore = Anti-personnel mine, Medevac = Medical evacuation by helicopter, OP = observation Post, LP = Listening Post, S&D = Search and Destroy, ARA=Aerial Rocket Artillery (Gunship), CS = Tear Gas, WP = White Phosphorous, 8 inch = 8" artillery, 155 = 155mm artillery, LMG = light machine gun, "Scout Birds" = LOH's, MG = machine gun, Bde = Brigade, 1D2/8 = 1st plt., 2D2/8 = 2nd plt., 3D2/8 = 3rd plt., 4D2/8 = 4th plt. 4 june 68: At 0915, D/2-8 Cav, VIC YD325390 spotted and engaged (2) NVA near a bunker. NVA evaded, element checking area at this time. At 1000 hrs fd (1) NVA KIA by S/A fire. Appeared to be a rice carrier w/rucksack full of rice. NVA had neg wpn & misc documents. Documents will be extracted. Also destroyed 1 large hooch and fd another large fresh blood trail. Element following trail at this time. 1115, D/2-8 Cav, VIC YD324393 reported contact with undetermined number NVA in bunkers. Received MG fire and grenades. Arty called in. Neg casualties. Ar 1210, D/2-8 VIC YD324398 requested medivac for (1) EM with shrapnel wound from friendly Arty. Medivac requested and completed at 1250. 1345, D/2-8, VICYD323390 reported scout birds working with D/2-8 receiving fire from bunker complex. VIC YD324393 Arty called in. Element was engaged with A/W fire resulting in (1) US MIA & (1) WIA with frag in leg from same grenade that got KIA. 1400, D/2-8, VIV YD324393 reported incoming 60mm mortar rds. 13 rds in 3 attacks. Engaged with ARA. 1500, message from Brigade: The 10th Sapper Battalion has (1) company at VIC YD327502, (2) companies at VIC YD385504 and the CP VIC YD323392, This information has an F-6 rating. At 1700 D/2-8 requested Medivac for EM injured previously. Medivac complete at 1723. 1815 following 8 inch and 155 prep D Company closed within 50 meters of KIA. Attempts to extract him under heavy CS concentration; were repulsed by 2 LMG's which covered KIA's position plus 4 to 5 other positions. KIA could not be extracted. Broke contact at 1815 using ARA to assist. KIA carried as MIA because body not recovered. Will attempt extraction of MIA tomorrow following air strikes and arty prep. 1820 2-8 foxhole strengths: 2/105/11. This represents two days (June 3 & 4, 1968) with D/2-8. During this 35 hour period one NVA was confirmed dead and one wounded, one GI was killed (body not recovered) and two were wounded. Battalion confirms we are up against the NVA 10th Sapper Battalion. As you read the daily journal you may think that this seems to be a lot of action for just two days. It wasn't, as we continue you will see that it was a typical two days in the field. 5 June 68: At 1615, D/2-8 VIC YD325393 reported receiving S/A fire. At 1625, D Co. reported incoming grenade or mortar rds. machine gun & S/A fire. Requested ARA. At 1745, reported (1) WIA. Requested Medivac on standby. 1755, WIA turned into KIA. Medivac cancelled. ARA called in. At 1820 WP & CS called in. 1945, KIA recovered. Company pulling back at this time. 6 June 68: 1345, D/2-8 Cav, VIC YD335388 fd (11) bunkers 6'x8' w/overhead cover. Also fd a rocket and mortar pit. Bunkers are being destroyed. Loading up for a "Charlie Alpha"
them in the daylight. The Air Medal was awarded after your 25th Combat Assault in the 1st Air Cav. 7 June 68: 1030, D/2-8 Cav, VIC YD327392 fd (1) NVA KIA, green uniform, neg wpn or equip, KIA by air strikes. 1105, D/2-8 Cav, VIC YD325391 fd (1) US KIA. KIA was identified by platoon leader as the MIA of 4 June. Body was partially decomposed. 1205, D/2-8 Cav, VIC YD327393 fd (4) NVA KIA. (2) by A/S on 6 June and (2) by S/A on 5 June. Also fd (1) SKS rifle (SN#191684). Rifle will be extracted. 1615, D/2-8 Cav. VIC YD327393 fd (3) NVA helmets, (6) 82mm mortar rds, (100) rds SKS ammo, (2) Chicom claymores, (81) fuses for 60mm mortar rds, (81) fuses for 82mm mortar rds, (18) bunkers varying in size from 2'x4' to 6'x8'. Material items will be extracted, bunkers are being destroyed. 8 June 68: At 1015, COL Standard CO, 1st Bde, 1st ACD touched down at D Co CP, was briefed by LTC Gibney and CPT Grannamann. He departed at 1100. 1710, D/2-8 Cav, VIC YD326393 reported their findings for the day. (36) bunkers & numerous fighting positions, (36) 82mm mortar rds, (1) 60mm mortar rd, (1) B-52 rocket, (1) 122mm rocket, (1) mortar baseplate for 82mm, (19) blocks of TNT, (12) fuses for 60mm mortar, (30) fuses for 82mm mortar, (2) chicom grenades, (175) rds of SKS ammo, (1) AK-47 magazine, (4) NVA canteens, (1) NVA belt, (1) NVA intrenching tool, and (3) chicom concussion grenades. 9 June 68: 1420, 36D/2-8 Cav, VIV YD366393 fd (2) 60mm mortar rds, (7) fuses for 60mm rd, (1) chicom mine, (30) AK-47 rds, (2) blue shirts NVA, (10) pair NVA khaki pants. unloading supplies. They usually landed amid the Company's perimeter. Thus the end on one week in the field. On the 11th of June the Company airlifted to LZ Betty where they took up base defence for the next six days. Base defense of a Landing Zone was considered rest for us Infantrymen. Vets who served in Artillery Units will tell you it was hell being on forward arty bases but it was nothing like being out in the "boonies". When we were on LZ's we'd get our packages from home and sometimes get a change of clothes and a hot meal. On the LZ's we had bunkers for some protection although we didn't sleep in them because of the rats. We slept on top of them and would scurry into them if we started getting incoming rounds. We airlifted off LZ Betty on June 18th for LZ Pedro where we took over base defense for two more days before heading back to the field on June 19th. 19 June 68: At 0735conducted CA from LZ PEDRO to VIC YD276511. At 1000, VIC YD264511 fd a bunker 8' x 10' x 6' W/overhead cover. no sign of recent use. 20 June 68: 0728, 26 & 36 D2/8 Cav C/A from LZ PEDRO to VIC YD348472. Initial lift off 0655, final touch down 0728. At 1015, D2/8 requested Medivac for (1) EM suffering from wounds by a trip wire detonated grenade type booby trap. Medivac completed at 1035. VIC YD353475. 1045, D2/8 Cav, VIC TD353475 fd (1) chicom grenade booby trapped. Detonation device was a trip wire from a grenade across small trail and attached to small branch. Booby trap destroyed. At 1510, NPFF D2/8 Cav, VIC TD347482 p/u (1) miltary age male w/neg ID. Detainee will be extracted to 1st BDE IPW. 1632, D2/8 Cav (-) conducted a final extraction from VIC YD349482 to LZ PEDRO. Initial lift off 1400, final touch down 1632. 21 June 68: 0655, D (-) 2-8 Cav C/A from LZ PEDRO to VIC TD300431. Initial lift off 0630, final touch down 1740. LZ Green. 22 June 68: 1200, 2D2/8, VIC TD245468 fd (3) bunkers used approx 1 week ago. One bunker 10' x 15' x 4' w/overhead cover. 2nd bunker 15' x 15' x 4' w/overhead cover. Fd documents, 2 khaki uniforms, and (2) anti personnel mines. Third bunker 8' x 10' x 4' w/overhead cover. Inside fd 6 blocks TNT. 1645, D2/8 extracted from VIC TD240460 to LZ PEDRO. Initial lift off 1632, final touch down 1645. 23 June 68: 0807, Co D (-) 2/8 Cav C/A from LZ PEDRO to VIC YD225461. 1740, D2/8 Cav conducted a FE from VIC YD226458 to LZ PEDRO. 1900, 2-8 Cav up on malaria control. reports redered by Lt. Kingston for D Co.
24 June 68: D Co continued base defense of LZ PEDRO. 1900, 2-8 Cav up on malaria control. Reports rendered by Cpt. Garner for D Co.
RECON by FIRE, using the M60 machinegun which fired a tracer round every fifth bullet. Spraying the jungle in the area where suspected NVA positions might be would sometimes cause them to return fire and reveal themselves. This was called RECON by FIRE. 25 June 68: 0800, D Co (-) airlifted from LZ PEDRO to LZ ANNE & became OPCOM to 1/12 Cav. Initial lift off 0800, touched down at 0810. At 0950 rest of element closed LZ ANNE. D2/8 released OPCOM to 1/12 Cav VIC YD285328. 26 June 68: 0900, D 2/8 Cav, VIC YD288321, while moving to the South, rec'd SA fire from (1) NVA with AK47. Element maneuvering at this time. Believe to be 6-7 NVA moving east or SW along trail. 27 June 68: 0700, D2/8 Cav, VIC YD292319 reported receiving S/A fire from the east. Element engaged with S/A fire. 0930, D2-8 Cav, VIC YD298319 fd (4) bunkers, (2) 6'x6'x4' & (2) 6'x8'x2' w/1 1/2' overhead cover. Also fd (2) documents. Bunkers show signs of use within last 3 days. Documents will be extracted. 28 June 68: At 1600, 16 D2/8 Cav engaged (4) NVA w/SA resulting in (1) NVA KIA, wearing green uniform, carrying AK47 (SN#947752), some documents, & a flashlight. The 16 leader believes at least (2) NVA were wounded. This was my first actual face to face meeting with the enemy. We were on the top of a small hill parallel with a trotter when four NVA came down the trail and stopped briefly, starring into our direction but failing to notice us. They turned and continued down the path into White Skull's 1st squad machinegun. I found it amazing to look directly into the faces of four enemy soldiers no more than twenty feet from me in the jungle and not be seen by any of them. How many times did they watch us go by? 29 June: 1005, D2/8 Cav, VIC YD296314 fd (13) hooches 6'x8'x4'. In (1) hooch fd (16)82mm mortar rds w/charges and fuses. Hooch and mortar rds destroyed. 1035, 3D2/8, VIV YD296314 fd (1) M-60 MG (SN 34069), (1) chicom claymore, (5) filters for NVA Gas Masks, (50) rds AK47 ammo, (300) M-60 rds, (1) NVA rucksack, (1) map case, (1) NVA Canteen, & (1) block TNT. 1310, D/2-8 Cav, VIC YD295318 fd a blood trail on log about two hours old. Believed NVA hit on RECON by fire. 30 June 68: At 1655, VIC YD288318, D2/8 Cav received fire from unknown number of NVA firing S/A and grenades. (1) US WIA, Medivac requested at 1700, and completed1852. One US scoutdog KIA. 1 July 68: Item #6, At 0930, D2/8 Cav, VIC YD293319 made contact w/2 to 3 NVA resulting in (1) NVA KIA, 1 AK47 CIA (sn#51747), and (1) US WIA. Medivac requested and completed at 1020. Element checking area at this time. 1230, (Ref item#6) (1) US WIA now KIA. At 1315 hrs, 2D2/8 Cav, VIC YD296319, while digging up bunker that had been previously destroyed by demo team fd (1) NVA KIA burried in bottom of bunker. NVA killed by S/A. Believe killed by 1D/2-8 ambush of 28 June, who engaged NVA approx 200 meters to West of bunker. At that time wearing NVA uniform, neg equipment or documents. 2 July 68: 0800, 2D2/8 Cav, VIC YD299311 fd (1) NVA KIA by Arty. KIA was wearing green uniform and had neg equip. Appears to have been KIA less than 6 days. 3 July 68: Co D continued S&C in assigned AO. This completes one full month (3 June to 3 July 1968) in the activities of Angry Skipper in Vietnam. During This 30 day period (most of which was my 1st month in Vietnam), D2/8 Cavalry made 4 Air Lifts, 4 Combat Assaults, Killed 10 enemy soldiers while wounding an unknow amount and captured one POW. We lost 3 US killed and 4 wounded, we found and destroyed over 40 enemy bunkers and captured numerous ememy weapons and supplies. This would be considered a typical 30 days for us in Vietnam. Some months were worse and a couple were better. Fire Support Bases were called Landing Zones by Air Cavalry Units. They were carved out of the jungle or woods or were in an open area where ever they could provide the best support for the Infantry units. Artillery Batterys of 105mm and 155mm guns, a command center, an aid station, a munitions supply dump, a landing pad for helicopters and sometimes a landing strip for C-130's, and surrounded by a company of infantrymen in bunkers, that's what an FSB was. 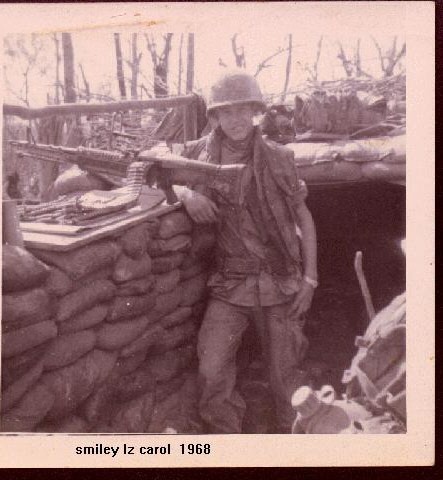 Here Tommy "Smiley" Harris stands watch behind his M-60 on LZ Carol in the mountains near the Laotian border. More to come! I will continue this daily log up to July 22nd, 1968. That's where I'll cut it off as far as day to day entries go. I will then focus on entries that involve some of our larger firefights. near LZ Carol in 68. The M-60 was a 7.62mm, gas operated, belt fed machinegun.